← Crazy. And my upcoming trip to Buenos Aires. 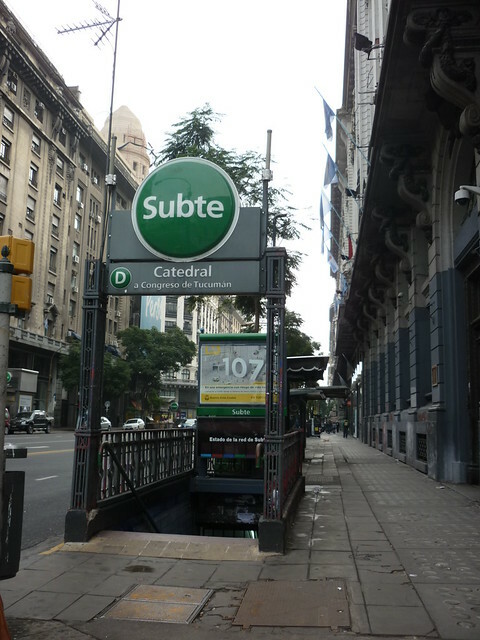 My trip to Buenos Aires definitely had a budget, and so I was really excited to be able to use public transportation while I was there, namely the subterraneo, or subte, BA’s version of the metro, and colectivos, or city buses. On Sunday, my first day in the city, I set off to San Telmo from my hostel in Palermo. I looked at the subway map and it seemed like a certain station was the closest to where I needed to go. Turns out, the subte map is not very proportional, and it occurred to me to look at a real map when I was already on my way. 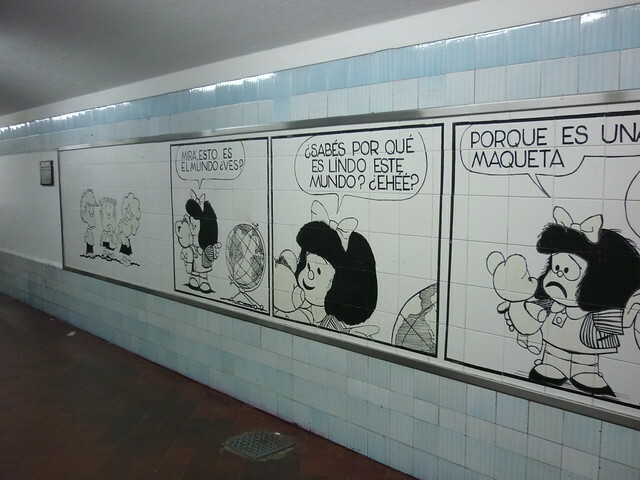 Needless to say, I spent a lot of time on the subte on Sunday morning, but at least I found some gems, like this Mafalda comic strip. The subte costs AR $2.50, which is about US $0.50. Yes, fifty cents. It’s subsidized by the state, that’s why it’s so economical. You can buy individual tickets or charge a card similar to Santiago’s BIP! card. In terms of cleanliness and upkeep, the subte is old and dirty, especially when you compare it to Santiago’s metro system. There are no security guards on the platforms, people can come on the trains selling things or asking for money, and there is a peculiar smell. 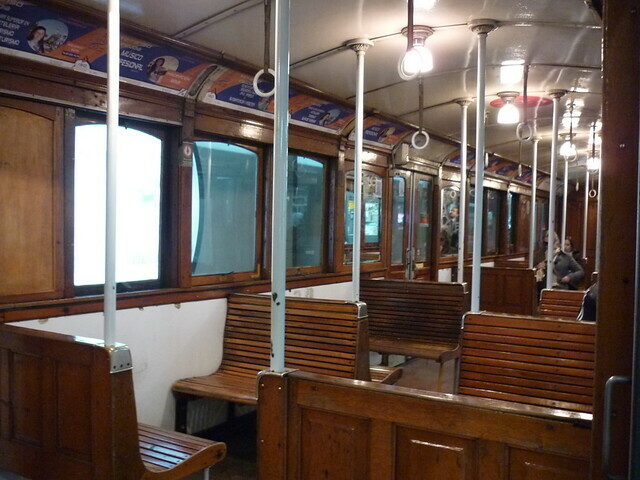 However, it does have its charms, and you can tell that back in the day, the subte was quite elegant. It is, in fact, the second oldest underground train system in the Americas (after New York). On Line A, the cars are from circa 1930 and they are made of wood! You even have to open the doors yourself. The city bus sytem (colectivos) puts Transantiago to shame. With 140 lines owned by 90 different companies, it seems to work like a charm. The only drawback is that you have to pay with coins, but the good thing is that at AR $1.25, (US $0.25) it’s a steal! Argentines also line up for the buses, which is very civilized compared to most of Santiago where people crowd on the platforms and it’s survival of the fittest to get on the bus. To learn how to get around Buenos Aires by bus, you can by the Guia “T” in any kiosk. Or, do as we did, and just simply go to the bus stop and ask someone which bus you need to take. The 29 seems to be kind of magic, as it took us most places we needed to go, and it also goes to Caminito in La Boca (although I didn’t make it there). We took the 37 from Palermo to the cemetery in Recoleta, and the 37 also goes to Aeroparque, the national airport that also has flights to Uruguay, Brazil and Chile. If you’re planning a trip to Buenos Aires on a budget, definitely try to use public transportation. It’s cheap and easy to use, especially if you speak Spanish. That being said, taxis are also relatively inexpensive. I ended up taking one from Palermo to Aeroparque, and it only cost AR $30, less than US $7. This entry was tagged Argentina, Buenos Aires, public transportation. Bookmark the permalink. I love public transportation – especially metros! “In terms of cleanliness and upkeep, the subte is old and dirty, especially when you compare it to Santiago’s metro system. There are no security guards on the platforms, people can come on the trains selling things or asking for money, and there is a peculiar smell.” – This sounds like D.F.’s Metro line. Ha! I’m so happy for you in B.A., hun. And envious! I can’t wait to go there myself one day. Yeah I understand that it’s scary to use public transportation in a new city and it’s easier just to take taxis everywhere, but it’s so worth it to learn to use public transportation in BA because it’s so inexpensive!